The increasing size of container vessels is raising the complexity of daily operations of both the carrier and the terminal. 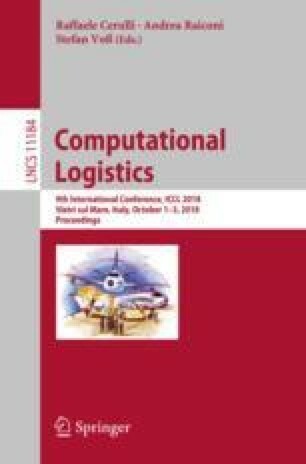 This paper focuses on stowage planning, the problem of assigning container to positions in a vessel. In particular, it studies the implementation of known planning strategies within an optimisation framework. Block stowage and crane intensity are presented and mathematically modelled on a simplified version of the problem. An experimental evaluation, on a large set of novel benchmark instances, shows that even in this simplified version the problem is not trivially solved. A matheuristic based on large neighbourhood search is presented, which is able to find a solution to all instances in short computational times. The author would like to thank the Danish Maritime Foundation for supporting this research under the project 2015-119 DTU Transport, Dynastow. Thanks are also due to Roberto Roberti for the fruitful discussions about the mathematical formulations.